Trains serving parts of the eastern region are being given a change of image ahead of a name change. One Railway's parent group is re-branding the fleet across Norfolk, Suffolk, Essex, Cambs and Herts to National Express East Anglia. 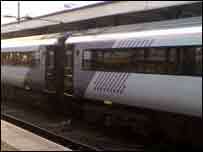 Rail pundits said the One brand was unloved and that the re-painting would be carried out in a cost-effective way. As well as One's livery, some trains still carry colours of former operators Anglia Railways and First Group. Guy Dangerfield, from the watchdog Passenger Focus, said: "I think at the end of the day passengers are not hugely concerned what the train looks like as long as it's clean inside and out and runs on time. "One was an unloved brand right from the day it was unveiled. I doubt there will be many passengers who will mourn its passing." Phil Haigh, the business editor of Rail magazine, said: "I quite like the (new) livery and I wasn't expecting to. "I suspect the public won't be sorry to see the name One go - many saw it as a silly name, it was confusing train announcements and it never really caught on." Peter Meades, from One Railway, said the re-brand on trains and at stations would coincide with routine painting and would cost no extra money. He added: "This is just a test application and there's unlikely to be any more done in the short term until we get closer to the re-brand which is likely at the end of February. "They've done one train to gauge reaction and see how it weathers, and how it copes with the cleaning regime."